Lately I have been suffering from somewhat of a crazy obsession. I am obsessed with strawberries. I hoard them away in the fridge, devouring them at every opportunity and incorporating them into every recipe or food item possible. But how could you blame me? Strawberries are so good right now - and they're coming down in price. After a few months of being strawberry-less as I'm not a multimillionaire, I'm making the most of the cheaper prices! I don't know what it is about the salty sweetness of peanut butter mixed with sweet juicy strawberries but it is so good and I have been topping my overnight oats with strawberries and melty peanut butter for the last month or so. 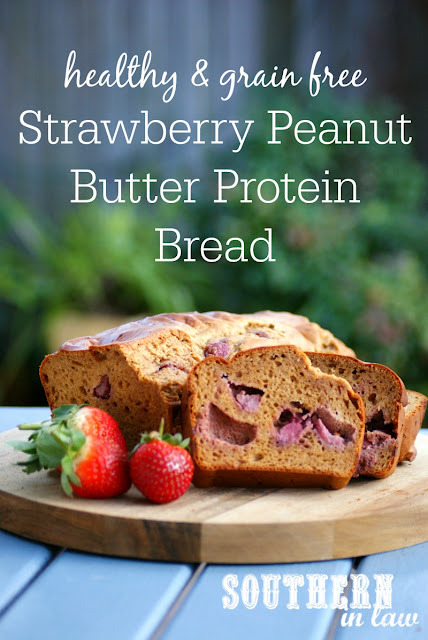 This Strawberry & Peanut Butter Protein Bread is the ultimate recreation of my current favourite combination. It's moist and full of flavour with juicy bursts of strawberries. Best of all? You can make it year-round as you can use frozen strawberries instead of fresh! 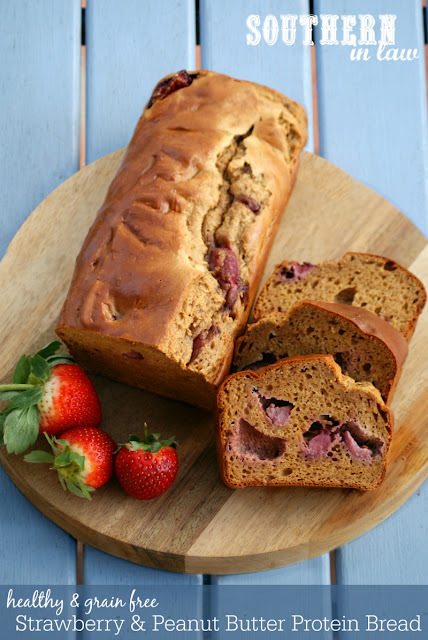 We're always looking for a protein packed treat to keep on hand for quick snacks or desserts and with over 14g protein per slice, this bread has fast become one of our all time favourites. This delicious Strawberry Peanut Butter Protein Bread Recipe is gluten free, low fat, refined sugar free and high protein with over 14g protein per slice. The perfect grain free snack to fuel you through a busy day! Grease and/or line a medium loaf tin and set aside. Beat your peanut butter, sugar and cream cheese together until smooth. Mix in your egg, egg whites and vanilla, mixing until smooth. Add in your peanut flour, whey protein, baking powder and milk, stirring until combined. 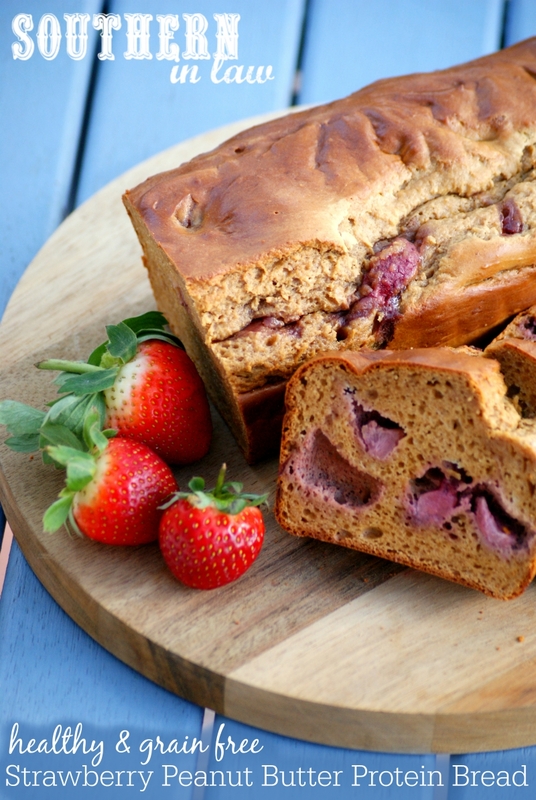 Stir through your strawberries and pour your bread mixture into your prepared tin. Bake for 40-60 minutes, or until cooked through (cooking time will vary depending on your tin size/altitude/oven etc) and a skewer inserted into the centre removes clean. If your top is browning too quickly whilst the middle is still gooey, simply cover it with foil and continue baking. 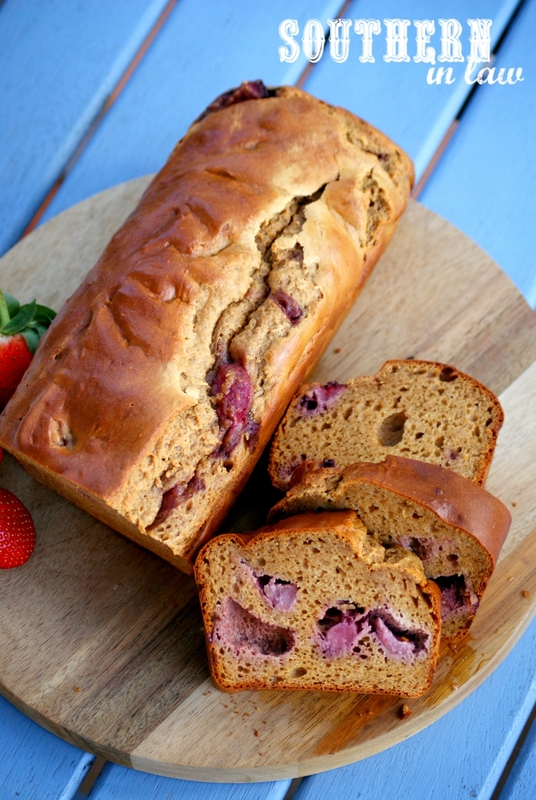 This loaf will keep in an airtight container in the fridge or at room temperature for 2-3 days. It also freezes brilliantly, simply slice and freeze in individual zip lock or freezer bags. Instead of whey protein you can use an equal amount of your favourite protein powder. Just be sure not to use a "protein shake" mix (also known as a meal replacement shake) which you just add whatever to as this most likely will not work. Our favourite whey protein to use in baking is this one which we highly recommend! What's one food you have been loving lately? And what's the one food you couldn't live without? But tell me, what's one food you are loving right now?